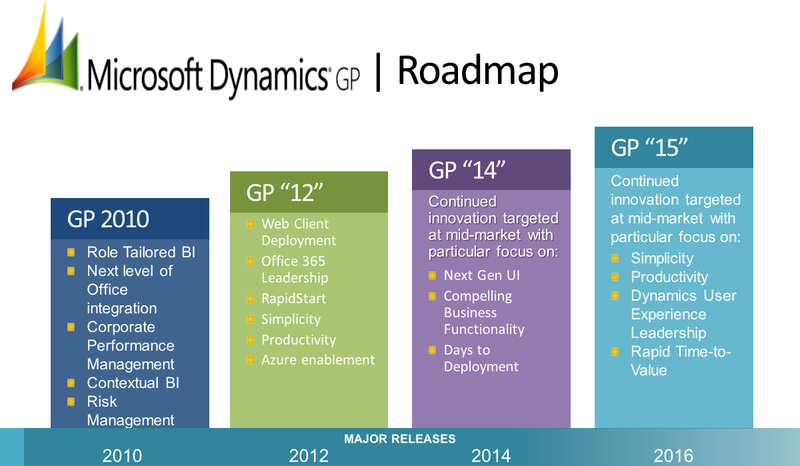 The Dynamics GP Blogster: Microsoft Dynamics GP Roadmap Update - Welcome codename GP "15"
Microsoft Dynamics GP Roadmap Update - Welcome codename GP "15"
Exciting times to be in the Microsoft Dynamics GP world! Web Client on the horizon, cloud computing in the not so distant future, tons of enhancements in codename GP "12". Now that I come to think about it, kind of make GP 2010 sound a bit obsolete, but wait? GP 2010 just got a refresh a few months ago. Oh, well! Now, I unveil for you the new roadmap which includes codename GP "15"
This roadmap update was unveiled at the GPUG Summit 2011 in Las Vegas, Nevada. Note that codename GP "15" includes a Rapid Time-to-Value focus for the middle market, which probably means you will see some improvements in the implementation and deployment cycles of the product, a carry over topic from codename GP "14". One has to imagine that given the changes in the core product architecture, deployment would become a focus going into the future. As usual, if anything new comes up I will let you know about it - as long as I am not bound by my NDA. Hey we hope it's newer version will perform better then it's earlier version, Microsoft Dynamics GP 2010 will solve all the error which we got in earlier version. But we haven't still got any review about the newer one how this is working.